I’ve never tried hair extensions as I’ve always had long hair however my hair is very thin and fine so I lack in volume. It is a nightmare to be honest. These hair extensions are great for first timers like myself. The colour match isn’t 100% as I have recently redyed my hair to refresh the colour so I’m waiting for it to fade. However I must say, it looks like low lights and I actually do like the end result. The extensions are 20 inches long, which is roughly the same length or a tad longer than my natural hair so these are great for adding the much needed volume that I lack in. This pack contains one 7.5 inch piece, two 5.5 inch pieces, three 3.5 inch pieces and two 1.2 inch pieces. This is enough for your head to add volume. In my case, I cannot use all of the pieces dues to my small head, very thin and fine hair as well as the little colour mishap to make it look more natural. 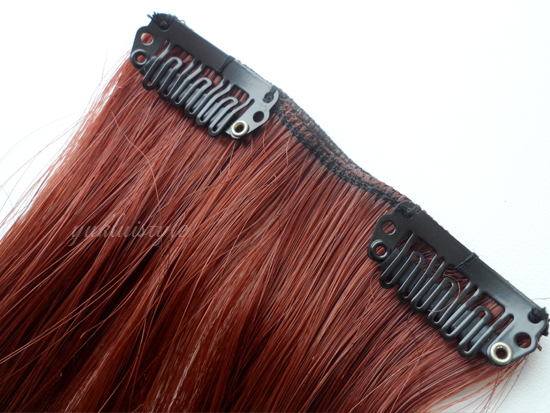 The grips/clips are easy to use and keeps the extensions in without sliding off and doesn’t require teasing. This is synthetic, made from kanekalon. As I am aware, you cannot use styling tools to style these, however there are ways to style these according to researching on Google but beware. Don’t expect these to feel like real hair, it is a type of plastic which is a popular material used. You actually cannot tell that these are synthetic. I would most likely trim the extensions to make it look more natural and blend with my hair length and style especially when I go for a trim at some point. It does give the added volume needed as you might be able to see. I cannot wait for the hair dye to fade more then I could put these to better use. These are low maintenance in terms of care and can tell that they’re going to be long lasting from the first use. For £16.99, you can’t go wrong! You can purchase these exact one from Wonderland Wigs. They give so much fullness! love your hair colour hun. I preffer your hair without extensions! Such a good price for real hair! I'm impressed. I used to wear extensions daily but haven't bought any since i've been wearing wigs for a while. Will definitely check these out! They look so natural! 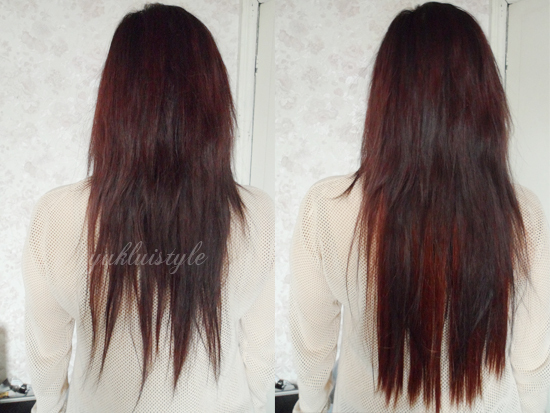 The colour matches you perfectly and extensions are always great for a volume boost! The hint of red is cool also. I may be persuaded to try some. I just love the color of your wig. You looking so nice wearing this wig. It is best for everyday use. wigs can help improve your appearance and it looks very natural. They can make you look younger than your age. I always like to try different type of stylish wigs and buy them from the online wig store Elevate Styles. I am going to buy this one very soon.